In March of 2015 IMTFI arranged for a comprehensive visit to India to gather updates on four of their sponsored research projects, introduction can be found here. 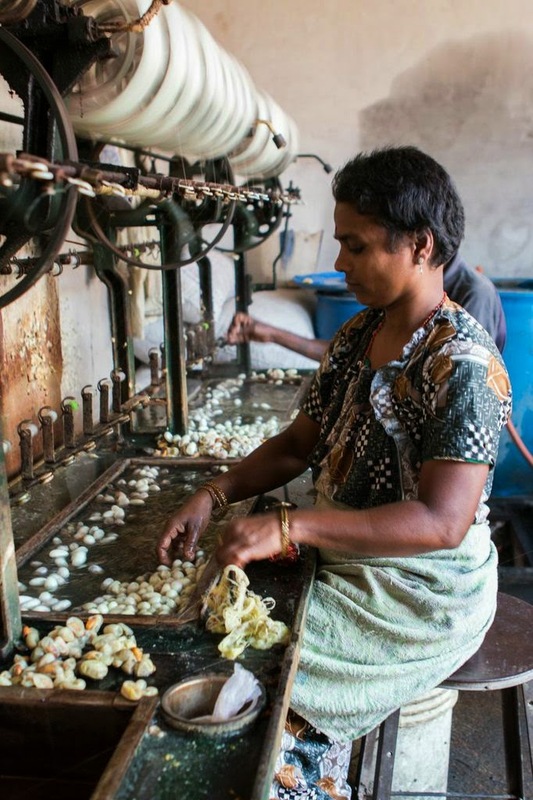 This third of four case studies takes a look at silk workers in Karnataka with Nithya Joseph. 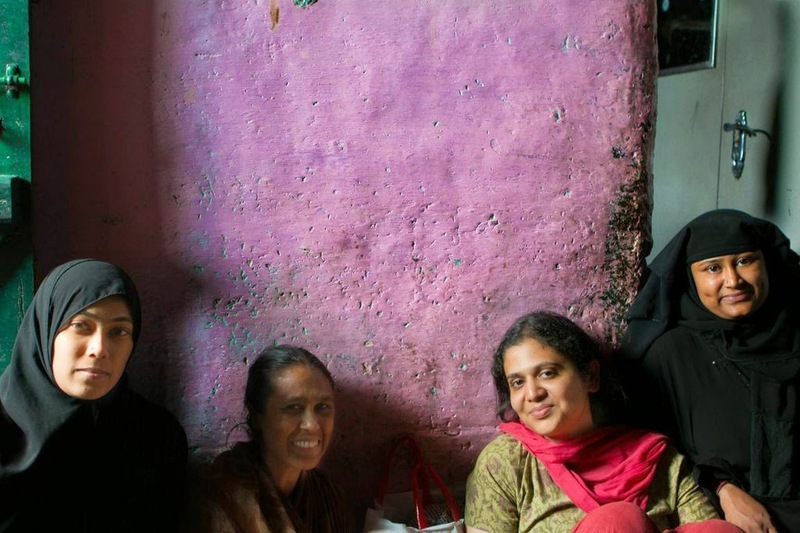 Devika Raman and Nithya Joseph with silk workers (middle, left to right). Like many of the other IMTFI researchers working in India, Nithya Joseph began with research questions around microfinance initiatives. "I was actually looking at microfinance in the Bangalore area and translating for a Dutch anthropologist. We were thinking about group solidarity in microfinance and which groups were supposed to be success stories." She was sent to study Ramnagaram as an example of a branch that had been an overwhelming success. 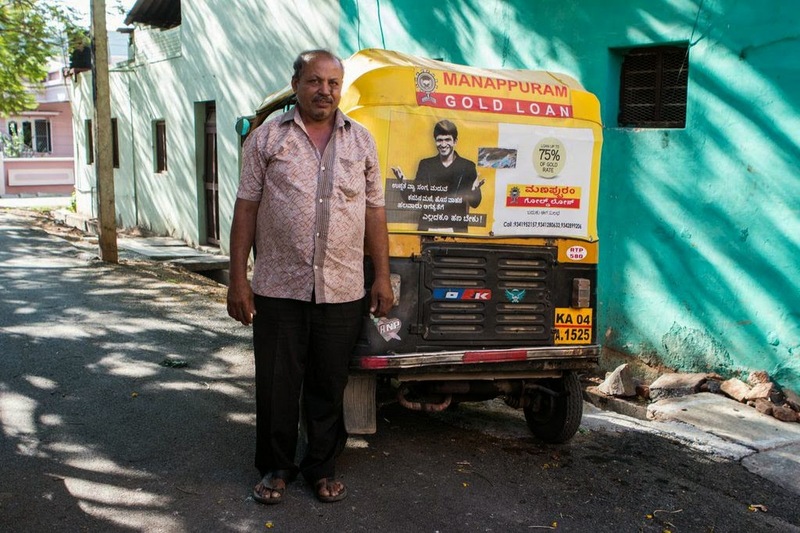 "A year later there was a crisis in the town; all the Muslim borrowers had stopped repaying." Joseph described how she came to understand structures of "multiple borrowing" that "were both about competitive microfinance and the about the ways in which the silk industry was itself structured and how debt relations were arranged." As Joseph explained, "it seemed like the most vulnerable women were the ones working in the silk industry, the ones not able to benefit from microfinance." She ascribed the reason for their condition in part to overlapping social roles occupied by key players in which "religious leaders could also be the silk factory owners," so that their "unhappiness and frustration" might be directed toward "competing source of credit," particularly when proprietors already "had to give more credit for loans and advances," and so "while they were supporting the revolt against microfinance as a way of protecting women from exploitation, they also stood to gain if their labor lost an alternate source of credit and continued to be dependent on them." She started out her doctoral work, in the same town, studying debt-based labor contracts in silk-reeling before extending her study to capital accumulation across the silk industry through her IMTFI research project. "IMTFI brought a grounded anthropology aspect to the work. Coming to the conference encouraged very particular ways in which to think. It allowed me to bring a completely different discipline to the work. One direction in which I would like to work is the materiality of capital. There are all these relationships in studies of the political economy of India," For Joseph these relationships included "how social relations organize the economy." She noted that "gold offers ways of mapping the relationship between capital and people; because any surplus income tends to be stored as gold, mandated by social pressures to own gold, and gold is often mortgaged both for reproductive needs and for investment in firms.” She would like to map gold ownership, other forms of capital, and indicators of well-being together across time and space, to really look and understand what these networks mean in terms of livelihoods, health, education, gender, and violence." 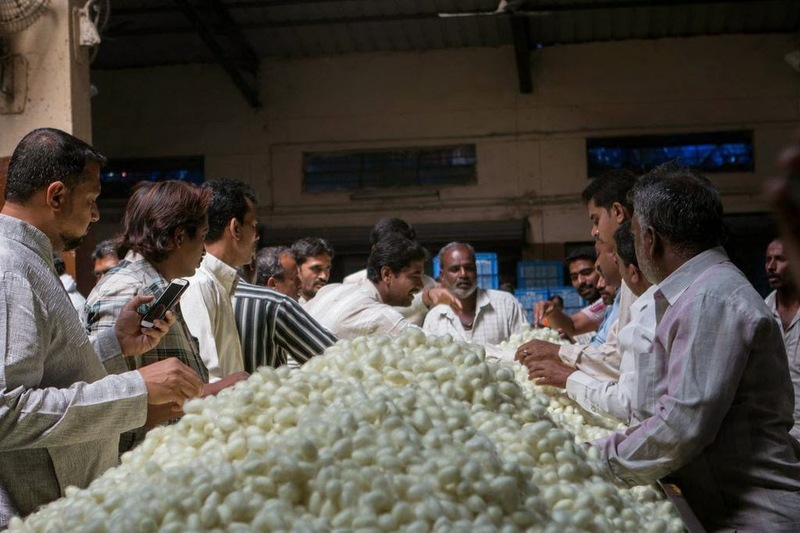 With Joseph as our guide, we began by tracing different aspects of the production cycles of the silk industry, starting with the giant Ramnagar Market in which Hindu farmers come to sell their bins of cocoons to Muslim reelers. The auctioneers ticked off numbers rapidly as transactions escalate and de-escalate, and only veterans of the market attuned to the complex choreography of gestures associated with established relationships that called for interpretation had the discerning set of skills required for the purpose. As an IMTFI researcher, Joseph brings a unique background from her affiliation with the Srishti Institute of Art, Design and Technology, where she facilitated research methods and creative writing courses. She explained how "design" was construed very broadly at Srishti and how she had conceived her master's thesis on debt relations." Srishti was an open space. There was a lot of freedom with course design and there were a lot of initiatives that engaged with local and national issues. I had no background in art and design, and it was exciting to work with students who could take ideas and translate them into visual terms." 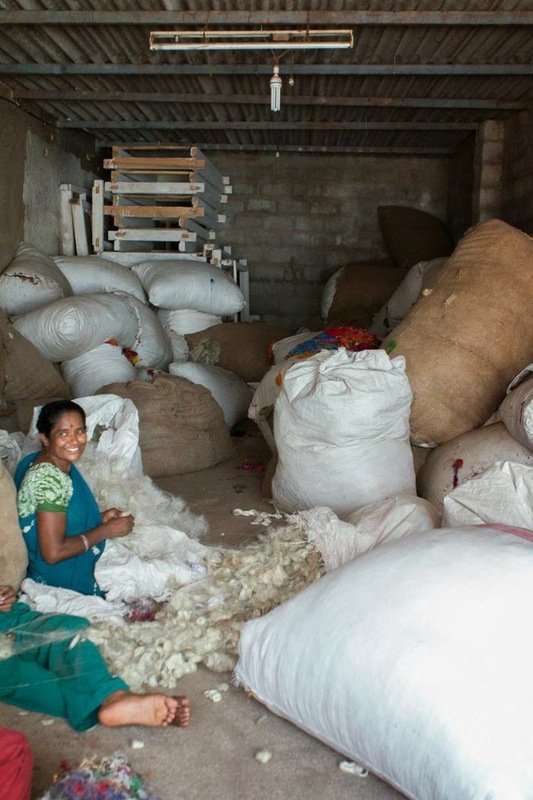 Because the cocoons represent a serious investment for many farmers, they often sleep under their lots. It is a largely male environment -- with only a few Hindu female participants and no Muslim women -- in which men socialize before the auctions begin. Muslim reelers have a designated waiting room, which was unused at the time of the visit. There were also fewer buyers on that day, according to Joseph, because of Friday prayers. A system in which farmers receive text messages via cell phones about baseline prices apparently encourages many to travel considerable distances. 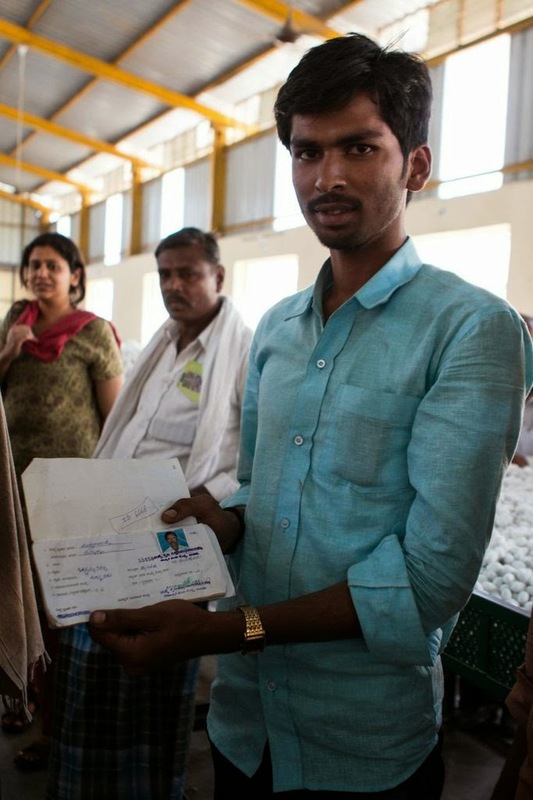 As one farmer observed, "it gives us hope because we know what price we’ll get when our cocoons are ready and also which town’s market will give the best price." Although we saw both smart phones and feature phones in use, buyers and sellers generally focused on face-to-face interactions and attending subtleties of how a buyer examines his cocoons. The set practices around transactions relied on paper records, which fluttered inside the large barn-like buildings as the human activity became particularly animated. 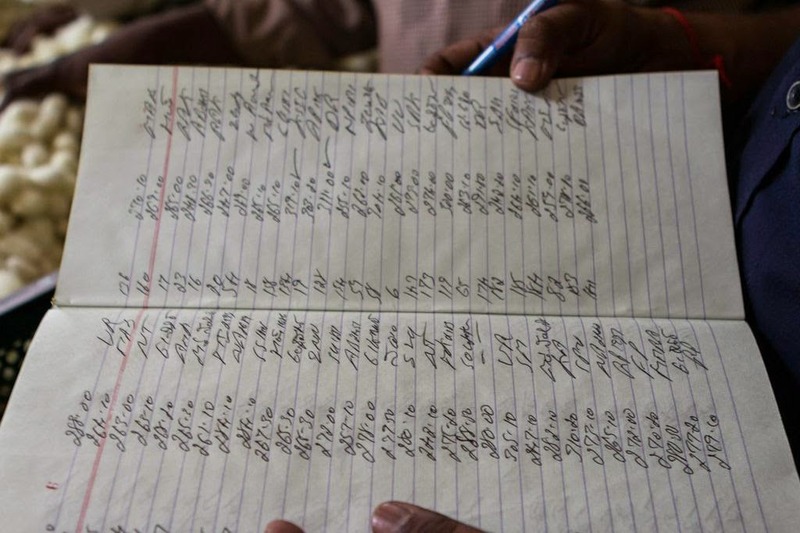 Transaction slips were transcribed into ledger books. Much of the assessment seemed to be based on visual and tactile interaction with the cocoons and decades of experience. Digital scales assayed the weight of the cocoons only at the end of the process. Far away from the action in a quiet room with a host of computers, the government managers of the silk market were busy in their digital control room. Unbeknownst to many in the market, plans were afoot for complete digitization of the transactions. Those without cell phones would be given tablets, so they could continue to participate in the system. Digitizing the cocoon market raises a number of interesting research questions about the relationship between technological innovation and inequality, and Joseph looks forward to documenting how the "before" and "after" will play out for participants. She hypothesizes that those already comfortable with the use of smartphones might welcome these changes, while those who are less comfortable may find it difficult to shift to the e-auction. 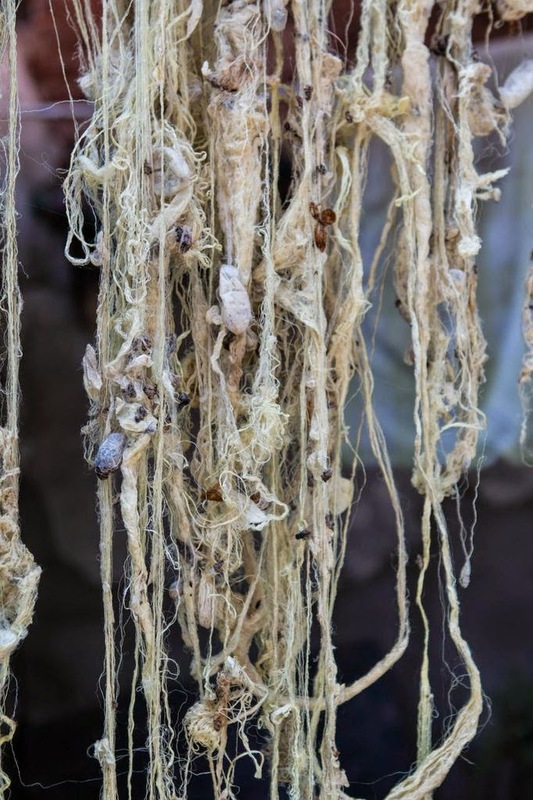 Agents from the agricultural ministry have already done considerable outreach about technological enhancements to sericulture and deliver lectures on best practices to those interested in improving their crops. This has reduced labor requirements and significantly improved productivity in silk cocoon production. Some families have been cultivating the crop for many decades and they are well-versed in the paper record-keeping practices that assure receiving government subsidies. They express confidence that technology allows rational decision-making, particularly about traveling to a market that may be as far as 400 kilometers away. In contrast there were other families who had been farming silkworms only for a few years. Although these families may be closer geographically to the market than many other farmers -- only traveling about a dozen kilometers -- they may be unfamiliar with market procedures, particularly using the text message pricing system and getting registered to receive the information. Certainly it will be interesting to see how technology changes the dynamics of the market and how it impacts financial inclusion. 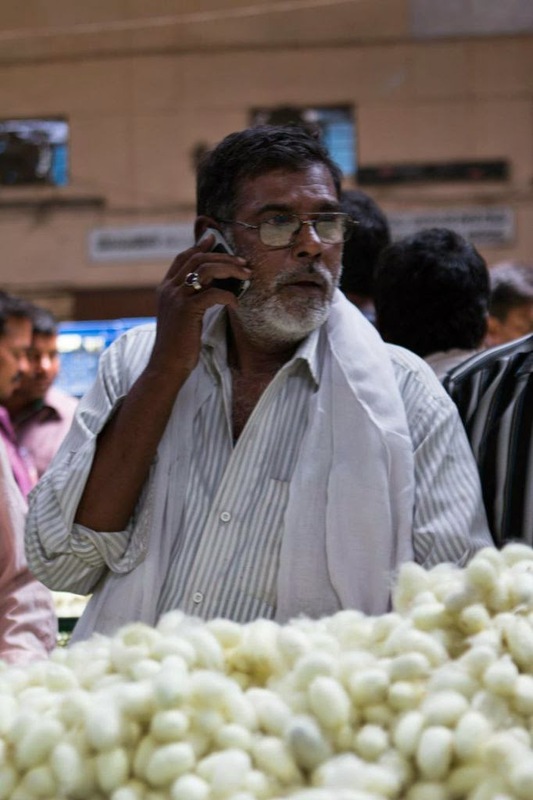 (For more on the theme of disintermediation, stay tuned this week when we revisit the work of IMTFI researcher Janaki Srinivasan on this blog.) When the cocoons are bought at the market, they seem to be "taken out of informal markets" in these "almost entirely open auctions in which everyone is present," but Joseph cautions that everything is "not as transparent as it appears," because there are "pre-negotiated prices, and people come to make arrangements and deals." Even if "it seems like those transactions are quite open and visible, the spaces where it is not are still interesting." To begin to understand the importance of mechanisms for savings and credit, our next stop while revisiting Joseph's field sites was a street with thirty-five jewelers. We encountered several groups of women purchasing jewelry for weddings. As Joseph explained, "I started looking at gold after going back and looking at inequality." She described an assignment at Srishti that asked participants to bring in different articles. 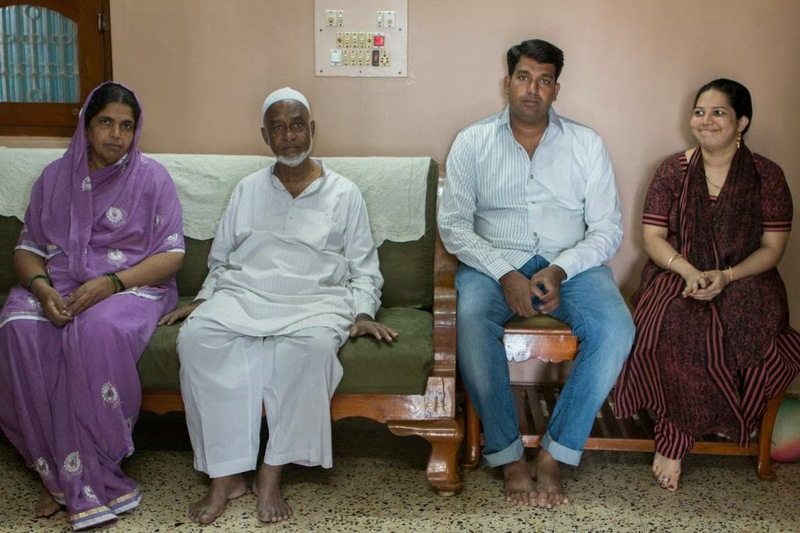 Her interest in gold grew out of an assignment for her research methods class studying inequalities for which a student -- whose father is a jewelry shop owner in in Uttar Pradesh and who had watched people buying gold -- chose to study gold ownership. He was interested in questions like "Who is making decisions regarding purchases?" and "Who will own and have control over the jewelry?" What does this purchase mean for the family?" The student was a non-Kannada speaker and was also finding that "as a male, it was difficult to do interviews on gold ownership" so she met him before college every morning to translate for him. She described the interviews as "really interesting" because it became clear that "gold is tied to so many aspects of people’s lives." "Some of the household scenarios in the interviews were very dramatic. People were really struggling." Joseph heard stories about abuse, alcoholism, and misogyny, but in some cases gold gave these women hope by making available assets that they controlled that could be used to pay for their daughters' medical care and educations. However, Joseph notes, "it’s double-edged: having gold helps in such situations, but the requirement to own gold and give dowries puts immense pressure on girls and their parents." Joseph pointed out that "objects of gold jewelry can be symbolic of the ways in which relationships are valued." She told how friends might buy earrings for each other as a way to express their close social bonds in which "I bought hers, and she bought mine." 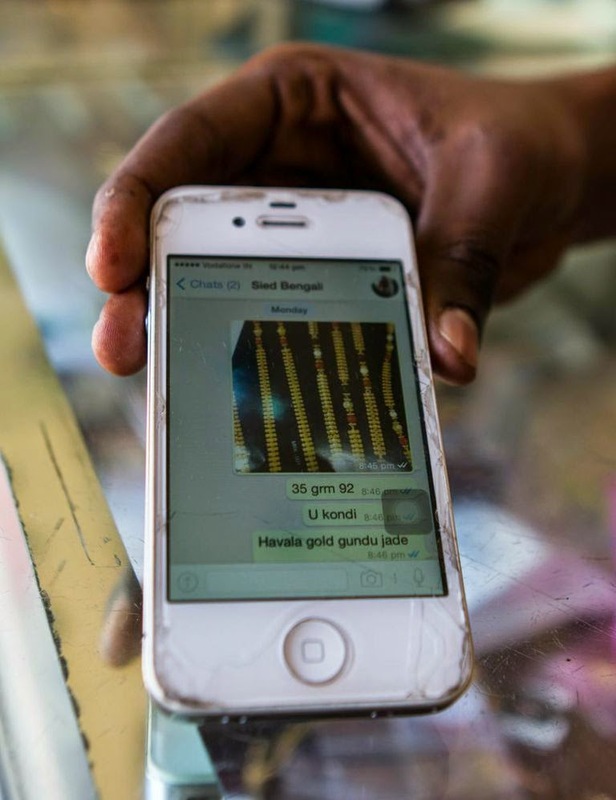 As Joseph articulated in her IMTFI presentation in December 2013, gold serves as an important source of capital in the silk industry, one which is often more important than financial services offered by the banking sector. However, formal and informal financial mechanisms are merging as many more conventional service providers are offering "gold loans" that present an alternative to pawn brokers. Gold jewelry is appraised on many factors, so the value of the metal as a commodity may be less important than the workmanship and appropriateness of the design. Muslim customers and Hindu customers may also favor different jewelry fashions. As more customers and craftsman are using smartphones, multiple-party consultations using platforms like WhatsApp can refine consumer selections as well. Jewelers actually offer a number of different financial services, in addition to sales, purchases, and loans around gold. This woman pays money into a special savings account that not only gives her interest but also offers a regular draw in which participants can gain additional winnings. (See our interview with Dan Radcliffe for other ideas for incentivizing rational financial behavior with irrational expectations). 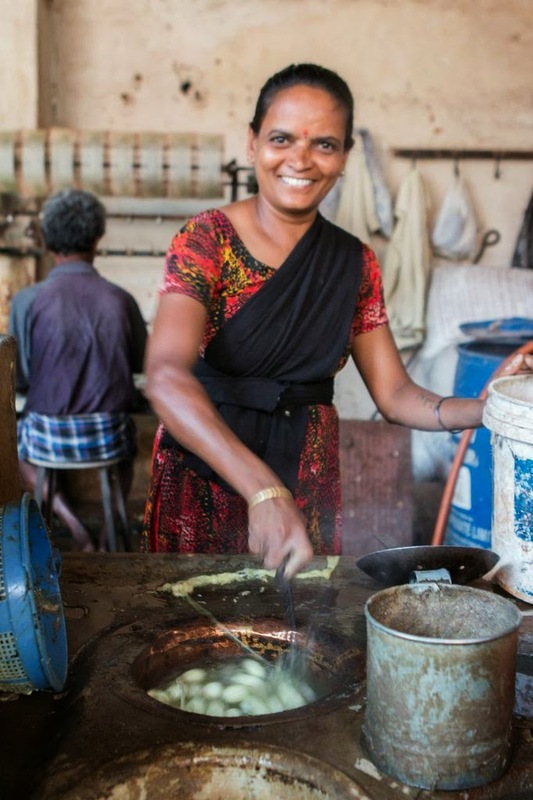 Even the poorest women were mindful of the importance of gold loans. In a sorting area for some of the lowest wage worker who clean silk waste, women described how gold loans were critical for paying home-building and other expenses, such as dowries for daughters. Even from these very poor participants we heard thanks to the government's financial literacy efforts -- some already had no-frills zero-balance bank accounts and chose to approach the banks for gold loans. Others chose to pay relatively high interest to local pawn brokers, which at a whopping 24% interest rate could contribute to spiraling debt, but they appreciated the flexibility and ease of negotiations of working with a more informal relationship. Those who availed of gold loans from private financial institutions specializing in gold loans commented that they often offered lower interest rates but less flexibility. Gold loans could be important for building costs, medical expenses, and many kinds of liquidity requiring situations although they could make saving for serving the loan more frustrating for the borrowers. Although the fact that financial services companies may send text messages to alert borrowers in time to prevent interest accruing on compound interest, gathering money to forestall this could be stressful for the participants. We also visited the home of a factory owner, who had been impacted by new mechanization imported from China. In Joseph's IMTFI presentation she detailed how liberalization of silk markets had largely been negative for this sector because it implied competing with cheap imports from China, although some people were better able to withstand the shock than others. Thus liberalization could lead to an erosion in traditional status for those struggling to adapt with less liquid capital resources. Many had recounted to her "with Chinese silk we lost our gold immediately." The family of reelers offered their generous hospitality to us and fondly recounted the recent marriage of a daughter who had a considerable gold trousseau as seen in her, as shown in her wedding video. Several days earlier, before visiting the field site, Joseph had presented a paper at the 17th Workshop of the Association Jeunes Etudes Indiennes, which focused on "Gender: Politics, Labour, Law, Development" at Banaras Hindu University in Varanasi, where the silk supply chain came another step closer to the consumer market in a city known for its long tradition of weaving luxury silk goods. In this way, we notice how the product moves from Hindu farmer to Muslim reeler to Hindu weaver. 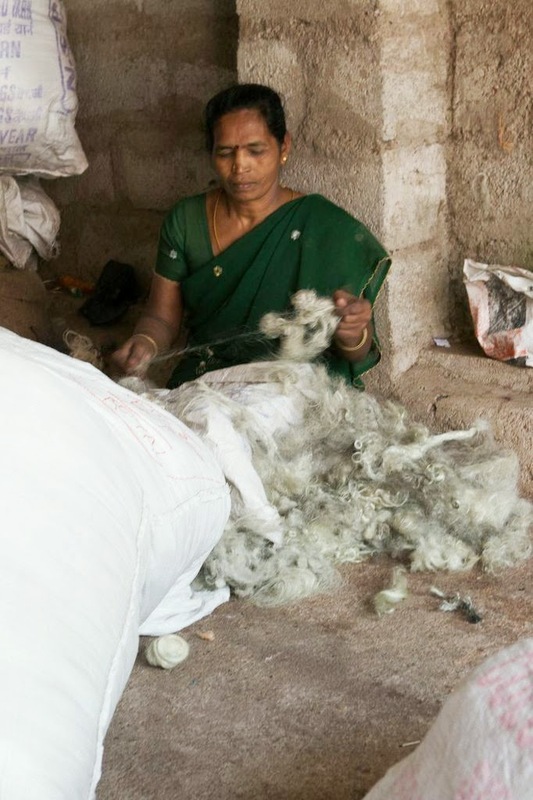 Joseph's paper, "And our ears have been empty since then," showed how she is continuing to refine her work on gold ownership, gender, and work vulnerability in South Indian silk-reeling hub. While in Varanasi she had a chance to visit handloom weaving units, which earlier bought raw silk from Karnataka but were now buying Chinese silk and synthetic yarn instead. Workers in reeling factories might receive loans conditional to perceived moral character, in addition their quality of work and years of service. As Joseph explained, "access to credit is complicated; there’s a spectrum in terms of how people are able to manage this credit, and how they might not have a productive way to use it. With new forms of financial transactions that they are not familiar with, transactions can spiral out of control. In informal systems, people are able to negotiate and discuss." 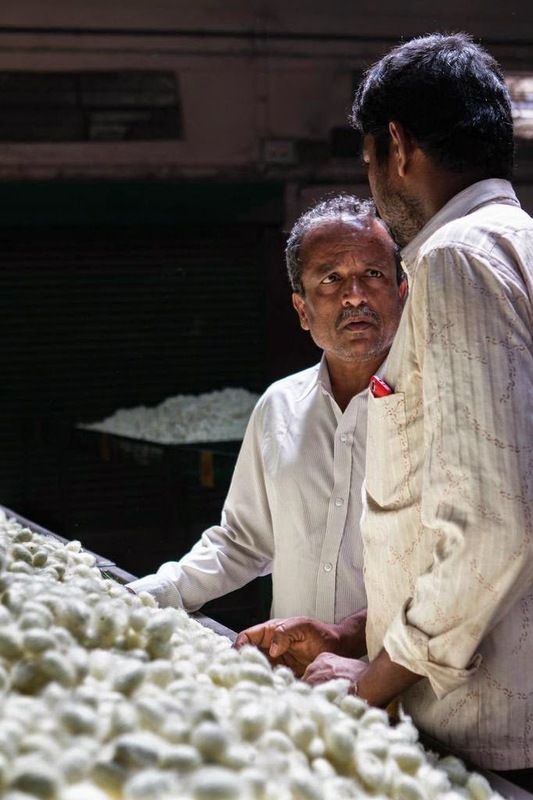 Traditionally the silk-reeling business "is seen as being unskilled and low paying work" with "very little capital investment needed for the equipment, but with high variable costs - working capital requirements - because the cocoons are very expensive." Joseph had noticed that the factory owners were expert in many tacit knowledge practices gained by "being able to gauge the quality of the cocoons, being able to do the work quickly and efficiently." With growing competition from machine-made imports, there might be pressure on both employers and employees to consider exiting the industry. However, employers' capital is locked into advances they’ve given employees and employees can’t payback the wages advanced as they have no alternative skills." Even if one is operating on the margins, it is very difficult to stop, especially if one is not familiar with being outside the town. Although we weren't able to visit the factory with the new Chinese machines Joseph did show us how at the bottom end of the economic spectrum were producers of raw silk. In these establishments owners and their families worked in the factories with few, or no, employees. Although Joseph is busy trying to finish her PhD and balancing the suggestions of a political economist and a social economist as supervisors, she is interested in expanding her work on mapping these financial transactions because she is interested in "listening to how people and assets have moved across space." As she visualizes this map, Joseph feels that it's important to keep in mind the whole production chain and understand how the different social groups engaged in each process relate to their ability to accumulate capital. "I’m also interested in the materiality of silk through the various stages of production… the worms are considered sacred by their rearers, and the final silk product is considered to be pure and used for auspicious events while the process of reeling which happens between these two stages and involves the dead worm is seen as being unclean and employs marginalized groups, and the stigma associated with the work and the low value added at this stage reinforce marginalization, whereas higher caste groups are engaged in the other processes, and they are able to negotiate a higher percentage of profits." 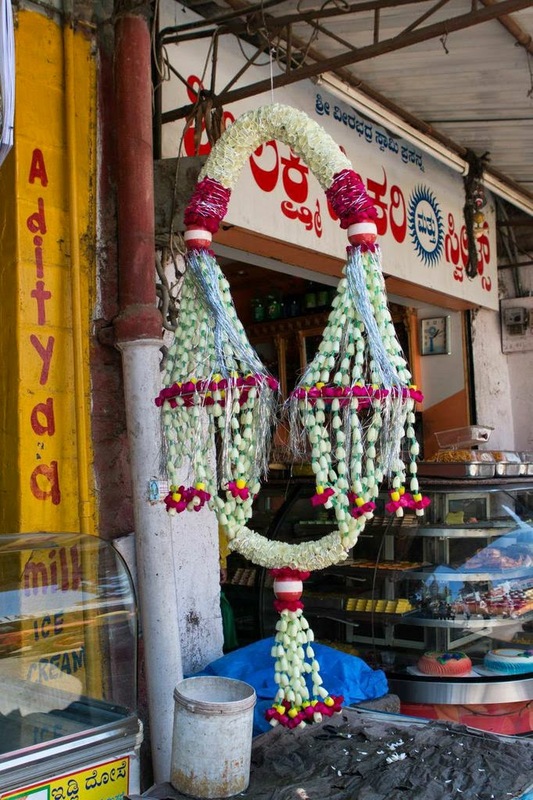 We passed a shop displaying festive decorations that were made of cocoons, which were often worn by local Muslim politicians, celebrants, or other prosperous citizens while Hindus do not make use these garlands.